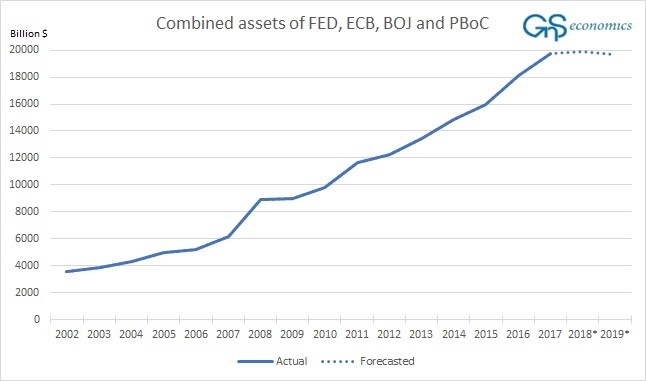 We’ve been warning on the risks of so called unorthodox central bank policies, including zero and negative interest rates and asset buying programs, for several years (see, e.g. this, this and this). Now, the era of global quantitative tightening, enacted by the Federal Reserve, will bring an end to the ”global synchronized growth”. In the March issue of our Quarterly Review, we mapped out the causative channels of quantitative easing (QE) and quantitative tightening (QT) based on our own analysis and on latest academic research (see Figure 1). Their effects on the economy and on financial markets have been widely misunderstood. We also presented the not well-known negative long-run effects of low interest rates. Figure 1. 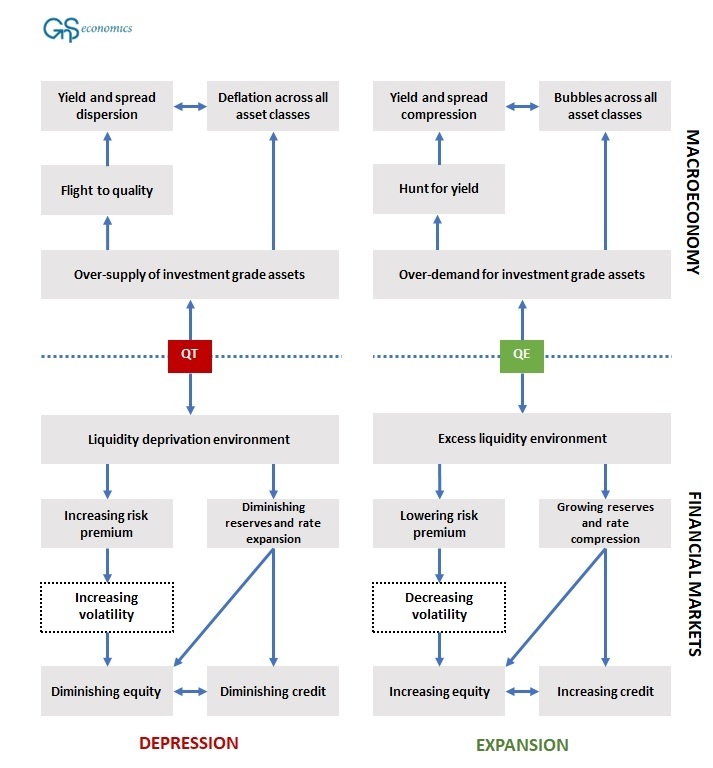 The causative channels of quantitative easing (QE) and quantitative tightening (QT) in the macroeconomy and in financial markets. Source: GnS Economics. Our analysis led us to conclude that, because QE has been extremely efficient in rising bond and stock markets, QT will be as effective on bringing them down. QE and the ultra low interest rates have also created a fragile banking sector and ’zombified’ the global economy, which will be unable to cope with rising interest rates caused by the global tightening. This is now already visible in the emerging markets. Global slowdown, and more, will follow when the global QT starts in honest (see Figure 2). The March issue of our Quarterly Review is now freely downloadable from our Publications page.